In the summer of 1950, Ben Carlin and his wife Elinore left Halifax, Nova Scotia in a World War II amphibious jeep, nicknamed Half-Safe, bound, ultimately, for Birmingham, England. 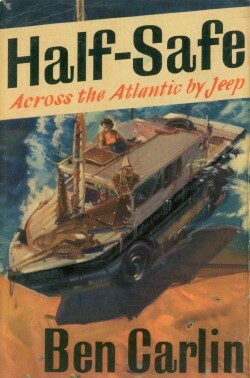 Carlin’s book Half-Safe: Across the Atlantic by Jeep is the tale of their journey. Unique among “voyage around the world” books, reaction of my friends and family upon hearing me summarize Half-Safe’s voyage was, more often then not, to deny that such a voyage was possible. Indeed the Carlins found the same problem during their voyage, and sometimes found it difficult to get the publicity and sponsorship their voyage deserved. But it is true: Half-Safe, a souped-up amphibious Ford jeep, purchased surplus after the war near Washington, DC, carried the Carlins on land and on sea, and therein allowed them to work around the usual need to “ship the Land Rover across the Atlantic and then pick up the trip” that characterizes most if not all other round-the-world expeditions. It took Carlin five years to get to America, locate, modify, test and refine the jeep, find and marry his wartime sweetheart, and make his way to Halifax for departure. This is as good a time as any to pay a tribute to Halifax — the finest departure point anyone ever had. I’d gladly leave Halifax any time for anywhere in anything. The city glows with the same rich, warm flame of enlightened liberalism which lit medieval Aberdeen. In two years there, we entered only seven private homes, not more than two of which we are likely to see again. Once the major voyage-ending bugs were worked out of Half-Safe’s systems — and there were a large number of them, mostly involving different methods for carrying fuel — the Carlins set off for the Azores from Halifax on July 19, 1950. 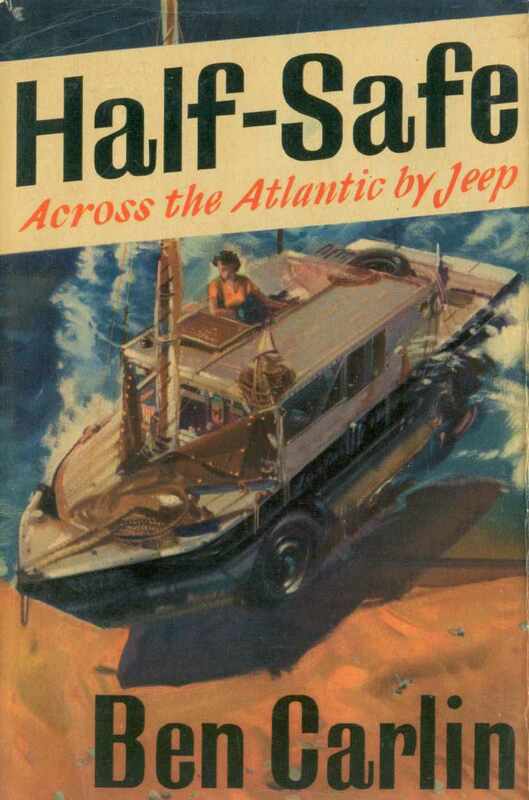 Their plan was to head for Flores; they arrived there 32 days later, having travelled through a hurricane, the jeep pummelled almost to the breaking point, having suffered tremendous seasickness (especially Elinore) and, one would imagine, testing their marriage severely. From the Azores they steamed to Madeira, and then made land at Africa at Cap Juby before driving overland through Agadir, Casablanca, Gibraltar, Lison, Madrid, Paris, Brussels, Denmark, Sweden, London and finally Birmingham, where they arrived on New Years Day, 1952. Despite their adventures at sea, the voyage overland was perhaps more challenging that the one over sea, mostly because of the variety of borders to cross, breakdowns of the jeep, and the need to hold shows to raise money to support the trip. The Carlins weren’t rich, and although there was some sponsorship from a North American magazine, and the promise of more from other sources, not more than once they were down to their last dollar and had to pawn their movie camera, or sell surplus fuel to continue on. Carlin is a witty writer, and the book is a rollicking good tale of adventure, and contains considerable technical details of their voyage. Carlin continued on around the world, and ended up back in Montreal on May 12, 1958, almost eight years after starting out. I purchased Half-Safe used from a bookseller in the U.S. using abebooks.com. It is out of print, but many other used copies are available for sale there. Book Information: Carlin, Ben. (1955), Half-Safe: Across the Alantic By Jeep, Andre Deutsch, London. Written January 19, 2004 at 3:12 p.m. Working in Cottesloe in 1976 and 77 I actulay met Ben Carlin.He used to come into the garage where I worked and his poor old Holden HR Wagon was quite a mess.I don’t think there was a straight panel on the poor old wagon.By this time he was not a young man and maybe just maybe he should not have been driving by then.But in saying that he was a wonderful old Gentleman.I am pleased I have found this webpage and 1 day I would like to read his book again. I have just read ”Half Safe ”. Obtained at a second — hand book sale in Edinburgh. It is a wonderful book. And a wonderful tale. Which Ben Carlin tells very well. I wonder if this story would be the subject for a film? Are Mr. & Mrs Carlin still with us? After spending three years in England refitting Half-Safe, Ben and Elinore were ready for the second part of the journey. From Paris they travelled overland to Calcutta via Istanbul and on to Delhi. By the time they reached India, Elinore had abandoned ship and Ben was forced to find another mate. From Delhi, Half-Safe travelled by water to Rangoon, overland to Saigon via Bangkok, and by sea and land to Alaska via the Philippines, Taiwan, Japan, the Aleutians and finally Montreal. 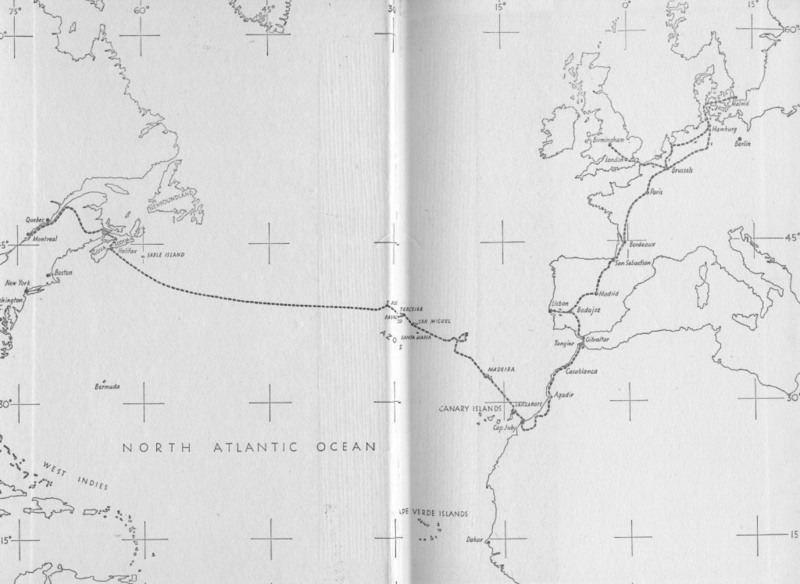 Ben Carlin completed his journey on 12 May 1958 and had travelled 17,780 km by sea and 62,744 km by land in eight years. As a tribute to this amazing adventure, the School has acquired Half-Safe and it is displayed prominently within the grounds. From communication with the school archivist I’ve learned that both Ben and Elinore are now dead, and that Ben’s daughter by his third wife is living in Perth, Australia. The Half Safe and crew visited my school in Montreal in, I guess 1958. We were given a great talk, a film, and best of all there it was in the parking lot. I saw the half safe in a garage on beech ave in overlea,md. some time in the late 50s or early 60s. yesterdays comment on seeing the half safe in overlea , md. the date should be late 1970s.